Now that AT&T has lost exclusivity to the iPhone, the carrier is turning to a new wave of powerful Android phones.The Motorola Atrix 4G is leading the charge, and it will easily be the best Android option for AT&T subscribers when it’s released next week. The Atrix is more than just an Android phone, though. It can also power a laptop. The phone will cost $199 with a two-year contract. The optional laptop dock will cost an additional $500, though that can be knocked down to $300 with rebates if you buy the laptop and phone at the same time. Motorola and AT&T are calling the Atrix the “world’s most powerful smartphone.” That’s a bold claim, but the phone is definitely speedy thanks to the dual core processor. Apps seem to launch instantly and scrolling through web pages is nice and smooth. 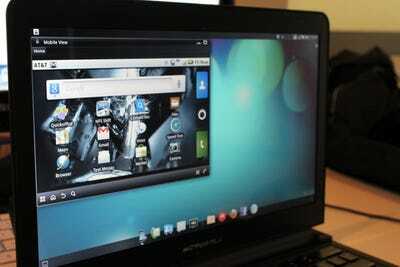 The OS on the Atrix is a bit behind the curve — it still runs Froyo, an older version of Android. Gingerbread has been available for almost three months now, so hopefully an upgrade is in the works. I also didn’t like that I was required to create a Motorola Blur account before I could even start up the phone. (I’m still not sure what good Motorola Blur even is other than giving the manufacturer a way to store your email address). The body of the phone is pretty standard for Android phones these days. There’s a four-inch touch screen, a front-facing camera, a mini HDMI out port, and four function keys at the bottom. All are designed nicely, but the plastic backing feels cheap and flimsy, bending and creaking under my grip.One neat feature is the fingerprint scanner on the power button, which you can use to unlock the phone instead of a password. Just swipe your finger along the sensor and you’re in. I also liked the screen. Resolution is excellent and games with 3D graphics look just as impressive as what you’d find on a Nintendo DS or PSP. Touch gestures are responsive and there are some great widgets included for managing wifi, Bluetooth, and aeroplane mode without digging through settings. The camera takes great HD video, which you can view on your TV with an HDMI cord. The results were excellent on my 30-inch TV, and Motorola says it even supports big screens over 100 inches. The only potential deal breaker with the Atrix is the battery life. It completely died on me twice while the phone was in sleep mode, so you can just imagine how quickly the battery drains during normal use. Using a task manager to close apps running in the background will help extend battery life, but not enough to make a huge difference. Make sure you get an extra battery or keep a charger handy. I said this in my initial impression of the Atrix, and I’ll say it again. 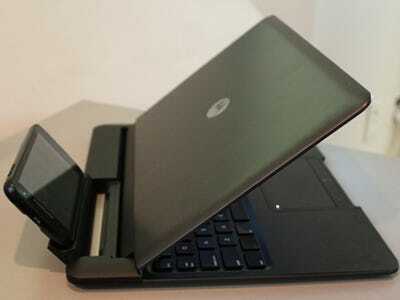 The laptop dock feels like a $500 gimmick designed to prove that the Atrix phone is powerful enough to run a computer. It’s essentially a hollow shell that won’t even turn on unless the phone is docked in the back. 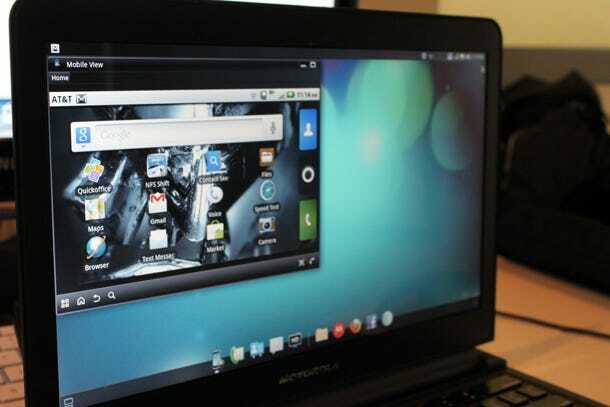 The OS only comes with a few apps such as Firefox and a media centre. The other apps are either shortcuts to websites like Motorola and Facebook or phone functions such as dialling and texting.There’s no way to download new apps, so you’re stuck with what comes out of the box. That means you’re pretty much limited to what you can do in the browser. You’ll have to use Google Docs and other online tools to get things done. You do have the option to use an emulator window that lets you control the phone and run your Android apps, but it feels awkward to do so without a touch screen. On the upside, the laptop is super thin and light, making it ideal for travelling. It also charges your Atrix while docked and acts as a speakerphone if you receive a call. 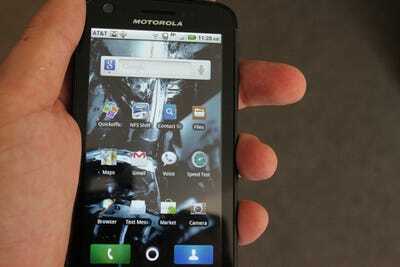 The “4G” in the Atrix name means that it operates on AT&T’s HSPA+ network. AT&T still hasn’t announced a launch date or available cities for the new network, so it was difficult to accurately evaluate how fast it really is. AT&T also warned me that although the Atrix will connect to HSPA+ right now, I may not experience 4G speeds until the official launch. They were right. I did a speed test several times over the last week in different locations throughout New York City. The fastest download recorded was 3.1 Mbps, about three times as fast as your typical 3G connection. Every other test clocked the speed around 1.3 Mbps, which is about what you’d experience when 3G is running really well. Hopefully the results will be more impressive than that once HSPA+ goes live. For AT&T users, the Atrix is the best Android option you have. (Not like there’s a lot of competition). If you’ve been dying for the same great Android experience people have been enjoying on Verizon, T-Mobile, or Sprint, then this is your phone. On the other hand, the laptop dock is a waste of $500. If the price goes down — way, way down — you may want to consider it. Otherwise, stick with your netbook.